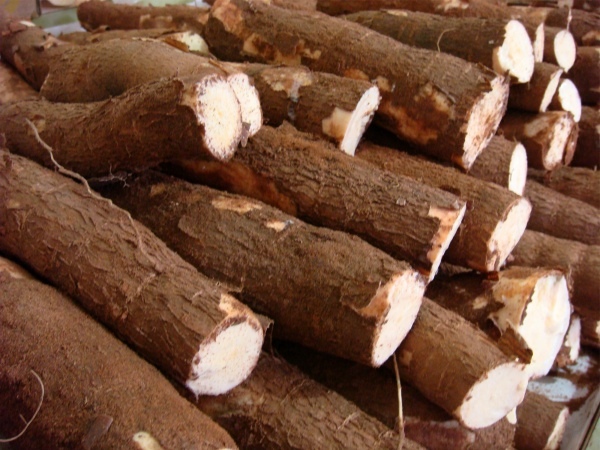 For this delicious recipe from Bahia you'll need manioc or yuca roots (pictured here), unsweetened coconut milk (which can be found in Brazilian or Asian markets) and azeite de dendê or red palm oil (which is harder to find, but can be bought at Brazilian or African markets). These ingredients should be available at online stores (check our sponsor here), and you're in for a very special treat indeed. As a matter of fact, these are ingredients you'll need for a lot of the yummiest dishes from Bahia, so you may as well have a supply at home! This recipe came to us from famous chef Yara Roberts in Paraty. Peel and cut the manioc and put in a pan with cold water and salt. Cook until tender, drain and reserve both the cooked manioc and the liquid. Discard any manioc fiber. Using a fork mash the manioc while still hot, using some of the liquid to help in the process. Do not use a blender or food processor. Peel and devein the shrimp, reserve the shells and make a broth to be used in the bobó. Sauté the onion and garlic in the olive oil until wilted. Add the pepper, 1/2 of the chopped cilantro and the tomatoes, stirring well. Add the shrimp and the pureed manioc. Check the amount of liquid and add more shrimp broth to thin the mixture, if necessary. Add the coconut milk, the remaining cilantro and the palm oil. Check for salt and pepper. Serve over Brazilian white rice.